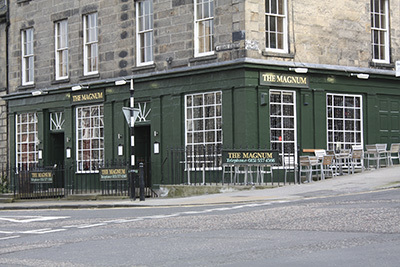 Tucked away in the corner of Albany Street in Edinburgh’s New Town, The Magnum is a hidden gem ideal for both a fine dining experience in the charming restaurant or a couple of glasses of wine at the cosy bar. 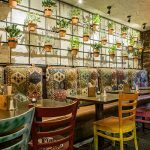 The rustic yet elegant décor is the perfect backdrop for the warm and relaxed atmosphere, with lighting provided by curtain fairy lights and twinkling candles adding a soft touch to the restaurant’s unique character. On arrival, we were welcomed by the friendly staff and led to our table. The service was excellent throughout the night and we were made to feel at home. The menu is a great combination of seasonal dishes and classic Scottish staples with a twist, it took us a while to decide as everything screamed delicious! As we made up our minds, chunky bread and homemade butter were brought to our table, prompting me to choose the soup of the day to dip the delicious bread in. The soup, tomato and country vegetable with paprika, was a deliciously warm and hearty dish. Sarah’s haggis spring rolls, however, stole the show with the spicy haggis wrapped in crunchy pastry served with a delicious barbecue and hickory relish. Our beautifully presented mains arrived shortly after. 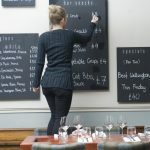 I ordered seared venison with parsnip dauphinoise and a creamy broccoli and blue cheese puree and Sarah went for the goat’s cheese lasagne with salsa verde, courgette noodles and a smoked cheese fritter. The venison was cooked to pink perfection and the lasagne was a unique take on the Italian classic. Despite the filling portions, the dessert menu was too tempting to refuse. We went for the Chranachan cheesecake and the sticky toffee pudding, the perfect way to end the night on a deliciously sweet note.